Eight persons, including three Amarnath pilgrims, were killed and over a dozen got injured in different road accidents in the district in the past 24 hours. European actor and supermodel Claudia Ciesla launched the Animation, Film and TV Production Department at Lovely Professional University here today. Rs 2 crore, given by Chief Minister Parkash Singh Badal to the Municipal Council for undertaking development works in the town during his much publicised “Vikas Yatra” taken out before the recently concluded Lok Sabha elections, have been creating chaotic scenes in the MC meetings here for the past about five months. 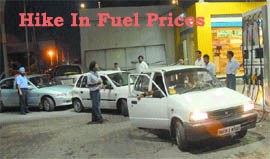 As soon as the news of a hike in fuel prices was flashed on TV channels, local residents started thronging petrol stations to get petrol and diesel at cheaper prices. The increase in the fuel prices will be effective from midnight tonight. From tomorrow, petrol will be dearer by Rs 4 and diesel by Rs 2 a litre. Hundreds of contractual computer teachers, led by their state president Gurwinder Singh, staged a dharna outside the house of Education Minister Upinderjeet Kaur in support of their demands of regularising their jobs. Former SGPC President Bibi Jagir Kaur took over as chairperson of the District Planning Committee (DPC) in the district courts complex today. The police has nabbed three auto thieves and recovered three vehicles from them today. Acting on a tip-off, a police party from Police Station No 8, laid a trap at the Pathankot bypass chowk on the Jalandhar-Jammu highway and nabbed three persons travelling in a Scorpio vehicle. Nawanshahr: Nilkanth Avhad, who had served as a Deputy Commissioner in the city from July 2008 to February 2009, assumed charge as Deputy Commissioner again, here today since Gurkirat Kirpal Singh, who assumed charge as DC here after Avhad was transferred to Gurdaspur in February this year, had to attend a special training for about two months. According to the police, three persons Sarabjit Singh, Honey and Harvinder, residents of Sarmastipur village, were crushed to death in a road accident involving a truck and an auto-rickshaw. The accident occurred at Sarmastipur village on the Jalandhar-Pathankot road late last night. The police has arrested the truck driver for rash and negligent driving. Three Amarnath shrine-bound pilgrims from Faridabad died and their two companions sustained serious injuries when a car in which they were travelling had a head-on collision with a truck coming from the opposite direction near Bhogpur. The deceased have been identified as Ramesh Kathuria, Jyoti Bhatia and Sanjay Kumar. The injured, Ajay Arora and Manish, have been admitted to a private hospital. The truck driver reportedly fled from the scene leaving behind the vehicle. In another accident, two occupants of a tempo were crushed to death when the vehicle overturned at Pratabhpura village on the Nurmahal-Phillaur road. Batala: Two persons were killed in two separate accidents here on Wednesday. Ranjit Singh, resident of Mullanwal village, succumbed to his injuries at the civil hospital after being hit a tractor-trolley near Tugalwala village. Driver of the tractor-trolley fled away. In another incident, Surinder Singh of Duniya Sandhu village was killed on the spot when his motorcycle slipped and stuck a tree. Meanwhile, the police has booked Amarjit Singh, resident of Bharath village, for injuring Baldev Singh with a dagger. A case has been registered under section 307 of the IPC. The accused hasn’t been arrest yet. Claudia will be the global face of the department and will coordinate with international universities for relevant tie-ups with LPU. She will also be giving important tips to the students of the Fashion Technology Department of the university during her next visits. Since she is very keen on entering Bollywood, the department will in return help her learn about Bollywood and provide training in Hindi too. Ciesla has been a reputed name internationally and has lately been associated with Hollywood projects, including “Karma Crime Passion” and “Reincarnation”. She has a tie-up with Dev United Films International for Global Peace and Globalisation of Indian Culture. She will also be featuring in a music video, “Woh Baariesh Ki Boondein”. If earlier, the issue of its utilisation had become a bone of contention between the SAD-BJP combine and the Congress, which has been holding reins of the Municipal Council, now the Congress councillors have started raising their voice against the recent communication of the state government to the councillors to pass resolutions to pledge the properties worth Rs 2 crore to PUDA in lieu of the development fund under the Optimum Utilisation of Vacant Government Land (OUVGL) Scheme. In this communication, it has been stated that PUDA had deposited a sum of Rs 238.25 crore with the state government on the condition that the Department of Local Bodies would transfer properties corresponding to the amount deposited to PUDA within 15 days. The Congress councillors, led by former MC president Lalit Mohan Pathak, alias Ballu, raised the issue of alleged conversion of the development grant into a loan. “The local MC has already been facing paucity of funds and the SAD-BJP government has further burdened it with the debt of Rs 2 crore,” said Ballu, while criticising the state government for befooling the people on the issue. They raised the demand of passing a resolution against the recent instructions issued by the state government in this regard. Countering the criticism by the Congress, the SAD-BJP councillors opined that even the Centre and state governments had been taking loans for development works, hence, the amount of Rs 2 crore should be utilised on the development of the town, whether it is a grant or loan. However, it has been decided that the issue would be discussed at a special meeting. Vipin Taneja, president of the district unit of the Congress (urban), while criticising the SAD-BJP government on the issue said if the CM had to put a burden of huge debts on the MCs, then, why he had been taking credit of providing funds in form of grants for accelerating the development in the urban areas, that too, by putting a burden on the state exchequer. The CM had spent huge amounts on taking out “Vikas Yatra” in the state for disbursing funds and had inserted advertisements in newspapers in this regard, with a view to taking electoral benefits during the parliamentary polls, alleged Taneja. Earlier, petrol was available at Rs 44.74 in Punjab and diesel at Rs 30.34 a litre. The locals would now get petrol at the increased price of Rs 48.74 and diesel at Rs 32.34. Sukhmohan Singh, owner of based Sehgal Petrol Pump, said in anticipation of an imminent hike in the oil prices, the companies had resorted to hoarding, which had resulted in the current situation. “The hike in the fuel prices would be slightly more owing to 27.5 per cent VAT in the state,” he added. The teachers said regularisation of jobs still seemed like a distant dream when the state government had even failed to enhance their salary from Rs 7,000 to Rs 10,000 despite the fact that the same had been promised to them in the start of this year. The computer teachers submitted a memorandum to Kapurthala SDM Anupam Kler. Earlier, the agitated teachers from across the state gathered at Shalamar Bagh from where they proceeded towards the Education Minister’s house in the shape of a protest march. Soon after taking the charge, Bibi Jagir Kaur said the first meeting of the 15-member House would be held on July 3 to discuss the on-going development projects and prepare a list of fresh development projects for the urban and rural areas. Answering a query, she said she would involve NGOs and NRIs for the overall development of the district. Bibi Jagir Kaur said the DPC would submit development plans to the central and state governments for release of funds. She was studying the functioning of the DPC of states like Gujarat and Kerala and would visit these states with the chairpersons of other districts for better functioning of the committees, she added. The SHO, Harjinder Singh, said Gurpreet, resident of Ghai Nagar, Manjinder Singh, resident of Dingrian village, near Adampur, and Avtar Singh of Balowal in Hoshiarpur district were nabbed for possessing a Scorpio, Zen and an Alto illegally. The police has also seized a PAN card, voter ID card, cheque book and a passport made on forged documents. The SHO claimed that Gurpreet had prepared fake documents of the vehicles. The police has started investigations in the case.